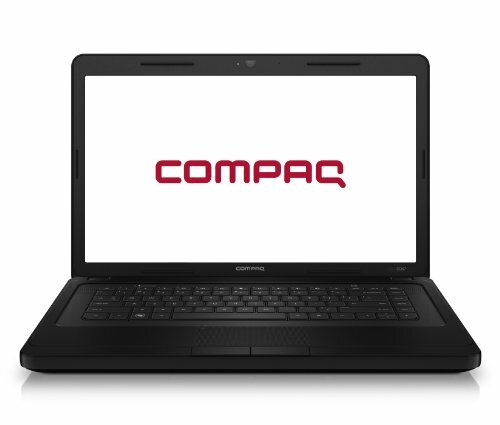 Below is our review of the Compaq CQ57-460SA, a 15.6" laptop, featuring 4GB RAM, 320GB hard drive and Windows 7 Home Premium. The exterior of the CQ57-460SA is finished in a matt black finish, with sleek lines and rounded corners. Asides from the Compaq logo on the lid, the entire notebook is finished in black - somewhat understated, but our testers liked the overall design - less likely to date than more extravagant and modern designs. The body felt sturdy and there wasn't much flex to it - it may feel a touch on the bulky size, but should hopefully last well without breakage from everyday wear and tear. The speakers weren't amazing, but in reality not many laptops provide incredible sound quality - if you are an audiophile we recommend you invest in a decent set of speakers or headphones. Intel's Core i3 380M 2.53GHZ Processor provides processing duties, and together with the fitted 4GB RAM we had no issues with speed during the test period. The system ran stayed pretty cool, and ran quietly during usage. The keyboard felt easy to type on and was fairly quiet during use - we cannot envisage any problems with using this keyboard for longer periods of time. Unlike many notebooks, the touchpad in the CQ57-460SA is located in the centre of the laptop, instead of to the left - a nice touch. The touchpad is finished in textured black, and provided accurate control over the notebook. Two buttons are positioned to the base of this touch pad - although mouse users can disable this if they prefer. The screen again performed well - 15.6" in size, it offered a decent, clear picture, and provided good viewing. If you wish to output the picture to a TV or monitor, then you can do so with the HDMI output. In addition to this HDMI output, you are also provided with a card reader, 3 x USB, Ethernet, VGA, DVD and headphones/microphone. Weighing in at just under 3kg, and measuring at 37.6cm by 24.7cm by 3.58cm, it is small and light enough to commute with if you so wish. Pros: Pros: Very cheap at around £300 - great entry level laptop. Cons: Cons: Only 320GB hard drive - although in fairness this will be more than enough for most users. To conclude: a decent specification laptop, from Compaq, at a bargain price.